A couple of weeks ago we told you how you could be spending a lot more money than you mean to on a Low Carb High Fat diet. But those probably aren’t the only ways you are blowing your budget. 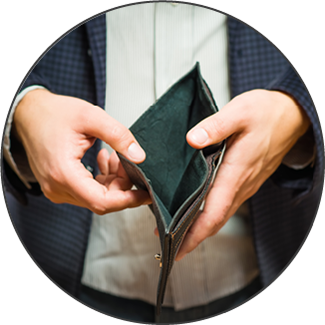 Here are more reasons your wallet is empty, and how you can fix it. Go onto any keto forum and you will see people giving recommendations for the fast food options they are eating every day. While it is true that you can eat fast food on a Low Carb High Fat diet (and with far fewer complications than if you eat a high carb diet that way), it isn’t ideal. Not only does fast food add up quickly, even when eating off of the dollar menu, but there is the issue of trans fats. Even “healthy” options from these restaurants can have trans fats, which the US is in the process of banning. Many other countries already have. Eating fast food is alright once in awhile. Some restaurants are even better than others, as far as the sources of their fats and how they prepare their food. You should still be trying to limit how often you eat out. When you do, consider lower cost options like a couple of dollar menu items that have been modified to your specifications (no bun, no ketchup, extra mayo, ect). Take Wendy’s; buying a Baconator is almost $6 for the sandwich alone. But two Jr. Bacon Burgers is a little over $3.50. A little outside-the-box thinking can slash your total for a similar meal. In the last post we mentioned that you will eat less of certain foods as your hunger ebbs, and you get fuller faster. Because of that, many foods that seem expensive are actually much cheaper than you would expect. For example, 5 lbs of raw macadamia nuts is $65 on Amazon. One serving is equal to 1 ounce, which is a very filling snack, or part of a larger meal. There are 16 ounces in a pound, meaning there are 80 servings of nuts in that five pounds. Let’s say that you eat a serving per day, in a 30 day month. You will get approximately 2 ½ months worth of food from that one purchase. That is less than $11 per week. The same argument can be made for avocados, coconut oil, olive oil, bacon, grassfed butter, and many of the other foods people complain about being too expensive. You just have to change your perspective, and understand how the budget evens out over time. Or any other site where recipes are common. We touched on this in the last post, about baking too many expensive confectionaries because they use alternative flour. The problem actually goes beyond that. A good example is this pin from our Pinterest page. It looks really good, but those ingredients are going to add up. It is a great recipe for a special dinner, but maybe not great for a regular weeknight meal. Resist the urge to get too creative with your meals, especially in the beginning. Keep your food simple. For sample menus check out our Complete Guide to Keto, or take advantage of our one-on-one Low Carb Coaching, Keto Coaching, and customized meal plans. There is nothing wrong with saturated fat, and you should try and break yourself of that misconception early on. However, that doesn’t mean you want all of your fat sources to come from animal products. It is expensive, and causes potential health issues in some people (like kidney stones). When you get plenty of fats from healthy plant sources, you will be boosting the hunger crushing power of your meals for pennies on the dollar. Coconut oil, olive oil, MCT oil, nuts, seeds, avocados, olives…these are just some of the fantastic non-meat or dairy alternatives at your disposal. Try to get at least half of your fats in a day from these plant based sources. Your budget will thank you, because very little is needed to see the benefits. Compare 1 Tablespoon of coconut oil (14 grams fat) with 4 slices of bacon (13 grams of fat). More plant sources will also keep your protein and carb macros in check. It is good to plan your shopping trip. But you don’t have to follow it to the letter. If you have decided to cook lettuce burger wraps that week for dinner, but you get to the store and see that chicken thighs are on sale, consider changing your plan. A good way to shop with flexibility is to plan your weekly meals around what is on sale, not the other way around. Decide how much meat, produce, dairy and other items you will need for the amount of time you are stocking up for. Then get whatever is cheapest that week, and plan simple meals based around it. What is so wonderful about this way of eating is that it allows for that flexibility and customization. There are no set meal plans, no worrying about calories. By the time you have been following it for a few months, you will be naturally hitting your macros and be able to cook like a pro. If you follow these five tips (and the five we provided before) you will be spending less eating this way, not more. Just one more reason to love Low Carb High Fat! Join the conversation! Follow us on Twitter, Facebook, Pinterest and Instagram.